Sanna (left) and Madelyn share a laugh with some of the youth we met during last weekend’s visit to Dipalata. “What time is it? What time is it?” This is the question I constantly asked myself before coming to Zambezi. It is as if time is the commodity that our lives function by. Something I have come to admire about Zambians is their view of time. They don’t put emphasis on being on-time, and there seems to be no such thing as being “late” in Zambia. Last Thursday Mama Love and her husband Duncan visited us for dinner at the convent. I remember Jeff saying at breakfast earlier that day, “Please be back at 18:00 hours for dinner, which will probably not begin until 19:00 hours.” Food wasn’t actually served ‘til 19:30. During our weekend trip to Dipalata last weekend, we woke up Sunday morning for church at 9:30. But breakfast was still being prepared at the time the service was supposed to begin, so the entire community willingly waited for us to finish our meal to start mass. Even businesses don’t run on a set schedule. A couple of our students, Alex and Wilfred, close their tailor shop every day from 10:00-11:00 the past couple weeks so they can attend our computer class. The fluidity of time engulfs itself in the Zambian culture. Nothing begins “on-time” and nothing ends “on-time.” I kind of love it. Even a trip to the market is always longer than expected. It usually goes something like this: we leave the convent and encounter many smiling children who stand under the warmth of the sun waiting to greet us. We exchange handshakes and hugs and maybe even teach them some songs (their favorite is “Boom Chicka Boom!”). The kids may teach us some words in the Lunda language, as others laugh about our poor pronunciation. 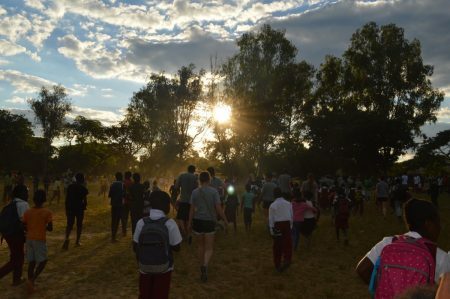 Then we continue on our walk to the market, down the familiar dirt road, usually accompanied by a few young Zambian children who reach to hold our hands. We may run into some of our students, maybe our dear friend Moses or Peter, and strike a humble conversation about their appreciation for their mother’s hard work at home, or how much they value the education they are able to receive through our classes. We part ways after some time and soon round the last corner of our path that will lead us to our destination. The fishy smells we sniff, the bright fabrics we pass by, the wide smiles we encounter, all these allow us the opportunity to pause and ask questions, to take a moment to wonder about the beautiful culture we have been introduced to for the past thirteen days. Then we may reach our intended destination of George’s market some 53 minutes later. Every day I learn more about what it means to understand Zambia. Our relationship with our Zambian friends is not dependent on whether or not we are on-time to meet with them or fitting as many meaningful experiences into our daily schedule as possible. Our time in Zambia is about slowing down, asking questions, being in the moment, and getting to know the people who’ve welcomed us here. Something I have found so beautiful is how willing people are to share their personal stories: Mama Violet sharing with me the story of her first-born’s birth, Jacob speaking about how he works long hours so that he can give back to the family that gave everything to him despite their impoverished circumstances. No one holds back their stories, and that is what I have come to appreciate so much. It goes deeper than just asking “Musana Mwane, munayoyo mwane? Good afternoon, how are you?” Taking the time to hear these stories has helped me to focus on building intentional and meaningful relationships with the people I have met here, thinking of time as more than just four digits on a watch. But I am still struggling how to bring back these ideas and thoughts back home and incorporate them into my day-to-day life back home. I have been cultured to always be cognizant of other people’s time. Being late is considered inconsiderate of others’ time. Our daily schedules are structured around time. We want to make sure every hour of the day is filled with some activity. I am learning to ignore the hours and minutes, and instead embrace the experiences as they come. Back home, we are constantly thinking about the next place we have to be, the next test we have to study for, the next meal we have to eat and who will accompany us. I am so used to stressing about being on time to everything back home that I have realized I commonly forget about the importance of stopping and having conversations with those around me, to hear how their day is going, how their families are, how their classes were. Since being here, I have been inspired to dig deeper than those superficial conversations we feel so obligated to have in order to be more intentional with the relationships I have back at home. P.S. to Mom, Dad, Maleka and Del, I miss you lots and cannot wait to give you the biggest hugs in two short weeks. I am healthy, joyful, and excited to share my stories with you and the rest of the family and friends back home. Mom, you should know that I am taking all the probiotics you sent me with and I have been eating relatively well. I even got gifted a bag of quinoa so you could say I am living high. Maleka, I am so proud of you for finishing your last few weeks of high school, I cannot wait to come home and celebrate all your accomplishments. P.S.S. I am sad to announce that we lost the annual Zam City Soccer match today after penalty kicks. Sorry to let all you Zambezi alums down. But Jeff Dodd did fashion his knee-high hot pink socks so I’d say it was a win. P.S.S.S. We are having some challenges with the local data network. This has caused some delays in our posts. If it keeps up, Jeff has promised to climb to the top of the nearest tall tree, holding his phone up to the sky and gesturing wildly. Despite our loss to ZamCity FC’s under 13 football team, we were still able to enjoy another beautiful Zambezi evening. Photo credit to Margarett Qaqish. Sanna, what Great insight and something we can all learn from. It can be a good thing to lose track of time and just be present. Thank you for sharing your story. It sounds like the soccer match was a close game and the pink socks a good distraction. I’m positive that fun was had by all. P.S. Morgan, when they call you chindele (which I assume means something similar to gringo in Spanish), is it pronounced similar to our last name? Love you to the moon and back! You have named something that I struggled with oh so much during my time in Zambezi and in returning back to life in Spokane last year. The fluidity of time, meaningful connection that occurs outside the confines of time and how to reconcile that with the structure of life back at home. Thank you for the reminder of the intention behind interactions is as important as the time we delegate to them. I hope you are finding more than bananas and eggs for your daily meals 😉 I look forward to sitting with you and hearing about it all when you return. Bridget, It filled me with so much joy to see you in front of those yellow walls that we talked so much about as you prepared for this trip. I can’t wait to hear your perspective now! This may be a day late by the time you read it but give Mama Kris a big birthday hug for me! Good luck to you all as you finish up your second week of classes! Thinking about y’all often! Such a beautiful reminder to slow down and enjoy the moments! Loved your uplifting post today Sanna! My heart especially melted when I saw Miss Madelyn surrounded by all those happy children…Wow, a moment that must have been for you! I went to bed last night thinking about you and woke up to that! Praying for all of you. Well I wrote out a whole response and sad to say it deleted and now I must rewrite about my love to you and the person that you are. Thank you for the reminder of what can come from life when we simply take a step back and live in the moment. Your post brought up a lot of memories of pure joy and peace. I miss our adventures to boy scout camp and Zion. These were days of intention and days when I felt like there was no where I needed to be except where I was. I remember how full my heart was watching the sun rise and set every day and just enjoying the conversations we had and the beauty we saw. I thank you for being someone in my life who brings out the intentional side of me. Who digs deeper than the superficial conversation and allows herself to really know me. I appreciate that aspect of our friendship so much. You truly amaze me in the person that you are in everything that you do. Miss your crazy confident weird self. Come back soon. And keep living in the moment and enjoying life. Life is crazy back here in the real world. I think we could all use a little trip to Africa as a reminder to step back and enjoy the little moments. Good thing we have you instead! Love you endlessly. p.s. Hi lyss miss you. jojo and I have a date sunday. also jeff keeps sending really weird texts and im not sure what to respond. Thank you. Sounds like you’ve nailed accompaniment, at least in Zambia. From my experience, learning to slow down, ask questions, be in the moment, so that you can get to know the people, is most of what leadership is all about. What a beautiful post. Cherish that last two weeks. Since time was such an important aspect of this post, I encourage you to stay in the moment and not get to eager about your adventure coming to an end. Take it one day at a time, one event at a time. Soak in every moment. I really appreciate your words Sanna. I’m feeling appreciative that you all are at a school, Gonzaga, that has this program that encourages such thoughtful and personal reflection. I can certainly relate to the push-pull of go-slow…….thanks for the nugget to chew on. Sanna, what a beautiful reflection. I have been praying for you and Lyss and everyone on the trip with you guys!! I haven’t been posting because it hasn’t been letting me for some reason. My computer had viruses! I hope you are having a fabulous time. God is really working through you on this trip! Love and miss you lots! Keep up the good work Sanna and to all the Zags, we are all learning much from this experience. 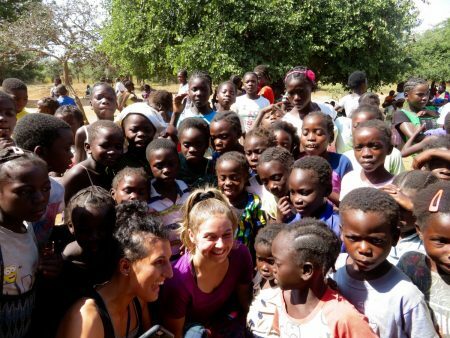 Glad to hear that Zambia has been a great experience for you, and that you are learning more and more each day. Your post reminded me of a Walt Whitman quote which goes, “Happiness, not in another place but this place. Not for another hour, but this hour.” It’s great to see that time over there is not structured, rather people choose to embrace the moment, company, and experience for what it is and what is should be. I hope that you have a lot of encounters like this during the rest of your time in Zambia. There is a whole lot of life you are experiencing squished into a month, so continue to make that the most out of it, and live in the moment. Have fun, be safe, and make some memories! Sanna it was so wonderful to see your beautiful smiling face in that picture! It looks and sounds like you are having an amazing time. Be safe and enjoy every experience this trip brings you! P.S. Give Alyssa a hug for me! I miss you so so much. I can’t wait to hold you in a couple weeks. I’m so happy you are having such an amazing experience, learning, maturing, de-stressing about time and schedules, and more. Thank you for taking your probiotics. Please make sure you continue to say your prayers. I hope you found a way to take pictures. Can’t wait to hear your stories. I love you beyond this world. I a, so so proud of you. My Sanna, After all the soccer practices and games I took you to, I expected more!!! LOL. I miss you so much and cant wait to squeeze the heck out of you. Time is best spent when I am with you and I talk to you about your campus kids who you love so much. I just found out that one of my dad’s best friends sons built a school and a hospital in Lusaka. He has become a legend. His last name is Rahmany. I wish there was a way to connect you with him. Anyhow, Finally you are learning about Persian time which is a bit slower that Zambian time. So when I am late you will know why. Love you azizam, take care. Dad. That was such a beautiful post! I am so proud of you and I can’t wait to get together this summer so I can hear all about this trip. Also, I am so glad you got some quinoa- I was wondering what you were going to eat 😉 LOVE YOU! I miss you so much and have been praying for your team! I know you are probably absolutely thriving over there and I can’t wait to hear all of your amazing stories. I can’t tell you enough how thankful I am that we are friends and I hope you know how much I love you!! Also really hoping everything with A&P went well :). You guys both inspire me so much. Love y’all!